It's official: I now have a DC driver's license. 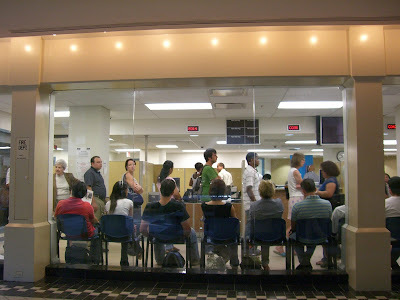 The DC DMV is legendary for its suckiness, but the actual visit really wasn't that bad - I just had to wait (and wait...and wait...). I stood in line for maybe five minutes to check in, then got a number and waited an hour to see the dude who looked at my documents and checked my eyes (not great, but not bad enough for a glasses restriction), then wait another 10 or 15 minutes for them to take my picture. Which features a double chin. Awesome. The dumbest part of the process is the ridiculous number of documents required to convert an out-of-state license. When I moved to California seven years ago, I just had to show my out-of-state license and my passport, take a written test, and I was done. DC needed my passport, my social security card (which hadn't been spotted in years - I had to go to the social security administration and get a new one), and proof that I live in DC. And they won't take just anything as proof. No, you have to have the original of your lease (I just have a copy), or a utility bill (only available after you've lived here for a month), or one of a long list of other things I didn't have. Oh and: somehow my organ donor thing didn't make it on my license, so if anyone ever asks you, yes, they can have my organs. I love this blog. DMV = fun, fun, fun, no matter where you live.